It is being frequently claimed by Catholic sources (e.g. Catholic News Agency, Catholic Herald) and even Wikipedia that eight Jesuit priests survived the nuking of Hiroshima with very minor physical damages in spite of them being located very close to the ground zero. It is also claimed that they did not experience any bad long-term effects of radiation. Did they really survive the blast? Yes, they survived the blast. No, their survival was not unexplainable. The Jesuits are at two locations: They reside at Novitiate of the Society of Jesus in Nagatsuke two kilometers from the edge of the city (and 3 kilometers from the epicenter of the blast), but at the time of the explosion some are at Central Mission and Parish House closer to ground zero. While their survival was uncommon, it was not exceptional. Thirteen percent of the 31,200 people living within one kilometer of ground zero survived the blast, according to this map on Hiroshima and Nagasaki Remembered, (Computed from data in A. W. Oughterson and S. Warren (Editors), "Medical Effects of the Atomic Bomb in Japan," McGraw-Hill Book Co., Inc., Chapter 4, 1956). From 1.0 to 2.5 kilometers, 73% survive; from 2.5 to 5 kilometers, 98% survive. The central portions of the cities underneath the explosions suffered almost complete destruction. The only surviving objects were the frames of a small number of strong reinforced concrete buildings which were not collapsed by the blast; most of these buildings suffered extensive damage from interior fires, had their windows, doors, and partitions knocked out, and all other fixtures which were not integral parts of the reinforced concrete frames burned or blown away; the casualties in such buildings near the center of explosion were almost 100%. The Novitiate was on a hill above the city of Hiroshima, according to Siemes. The parish house was in the city next to the church school. Both Siemes and Father Wilhelm Kleinsorge say the wooden structures built by "Brother Gropper" were heavily reinforced due to Gropper's concerns about earthquakes. I jump to the window to find out the cause of this remarkable phenomenon, but I see nothing more than that brilliant yellow light. As I make for the door, it doesn't occur to me that the light might have something to do with enemy planes. On the way from the window, I hear a moderately loud explosion which seems to come from a distance and, at the same time, the windows are broken in with a loud crash. There has been an interval of perhaps ten seconds since the flash of light. I am sprayed by fragments of glass. The entire window frame has been forced into the room. I realize now that a bomb has burst and I am under the impression that it exploded directly over our house or in the immediate vicinity. Down in the valley, perhaps one kilometer toward the city from us, several peasant homes are on fire and the woods on the opposite side of the valley are aflame. A few of us go over to help control the flames. While we are attempting to put things in order, a storm comes up and it begins to rain. Over the city, clouds of smoke are rising and I hear a few slight explosions. I come to the conclusion that an incendiary bomb with an especially strong explosive action has gone off down in the valley. 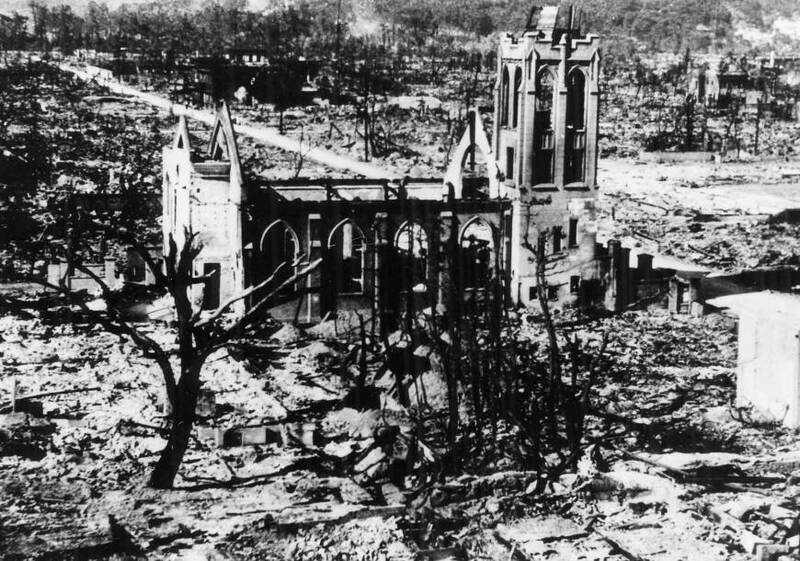 The survivors from the parish house later told Siemes about their experience: "The Church, school, and all buildings in the immediate vicinity collapsed at once." Valuables were removed from the rubble and buried in a clearing to protect them from the spreading fires. "Father Schiffer was buried beneath a portion of a wall and suffered a severe head injury. The Father Superior received most of the splinters in his back and lower extremity from which he bled copiously." Father Kleinsorge and Father Cieslik, who were near the center of the explosion, but who did not suffer burns became quite weak some fourteen days after the explosion. Up to this time small incised wounds had healed normally, but thereafter the wounds which were still unhealed became worse and are to date (in September) still incompletely healed. Siemes was doubtful of radiation's effects and suspected the poor healing was due to malnutrition. His knees grew weak. He felt excruciatingly tired. With a considerable expenditure of spirit, he managed to reach the Novitiate. He did not think his weakness was worth mentioning to the other Jesuits. But a couple of days later, while attempting to say Mass, he had an onset of faintness and even after three attempts was unable to go through with the service, and the next morning the rector, who had examined Father Kleinsorge’s apparently negligible but unhealed cuts daily, asked in surprise, “What have you done to your wounds?” They had suddenly opened wider and were swollen and inflamed. These four [Kleinsorge and three other survivors] did not realize it, but they were coming down with the strange, capricious disease which came later to be known as radiation sickness. Kleinsorge would be hospitalized in Tokyo for four months and was back in the hospital a year later. Suffering from fever, diarrhea and utter exhaustion, [Kleinsorge's] was a classic case history of ''A-bomb sickness.'' But he bore this life of misery ''with the most extraordinarily selfless spirit,'' continuing the self-abnegating pastoral life. In 1961, his energy flagged, and he developed liver dysfunction, high blood pressure, back and chest pains. On his hospital chart in 1976 was written ''a living corpse.'' He died the next year. As of 2007, there were 226,598 officially certified survivors of the atomic bombings still alive in Japan, according to Children of the Atomic Bomb. Which is the concrete remains of the Nagarekawa Methodist Church of Christ, a Protestant church, not a Catholic Church or Jesuit mission. There were serious injuries involved. Soon comes news that the entire city has been destroyed by the explosion and that it is on fire. What became of Father Superior and the three other Fathers who were at the center of the city at the Central Mission and Parish House? We had up to this time not given them a thought because we did not believe that the effects of the bomb encompassed the entire city. Also, we did not want to go into town except under pressure of dire necessity, because we thought that the population was greatly perturbed and that it might take revenge on any foreigners which they might consider spiteful onlookers of their misfortune, or even spies. At about four o'clock in the afternoon, a theology student and two kindergarten children, who lived at the Parish House and adjoining buildings which had burned down, came in and said that Father Superior LaSalle and Father Schiffer had been seriously injured and that they had taken refuge in Asano Park on the river bank. It is obvious that we must bring them in since they are too weak to come here on foot. At the far corner of the park, on the river bank itself, we at last come upon our colleagues. Father Schiffer is on the ground pale as a ghost. He has a deep incised wound behind the ear and has lost so much blood that we are concerned about his chances for survival. The Father Superior has suffered a deep wound of the lower leg. Father Cieslik and Father Kleinsorge have minor injuries but are completely exhausted. While they are eating the food that we have brought along, they tell us of their experiences. They were in their rooms at the Parish House--it was a quarter after eight, exactly the time when we had heard the explosion in Nagatsuke--when came the intense light and immediately thereafter the sound of breaking windows, walls and furniture. They were showered with glass splinters and fragments of wreckage. Father Schiffer was buried beneath a portion of a wall and suffered a severe head injury. The Father Superior received most of the splinters in his back and lower extremity from which he bled copiously. Everything was thrown about in the rooms themselves, but the wooden framework of the house remained intact. The solidity of the structure which was the work of Brother Gropper again shone forth. They had the same impression that we had in Nagatsuke: that the bomb had burst in their immediate vicinity. The Church, school, and all buildings in the immediate vicinity collapsed at once. Beneath the ruins of the school, the children cried for help. They were freed with great effort. Several others were also rescued from the ruins of nearby dwellings. Even the Father Superior and Father Schiffer despite their wounds, rendered aid to others and lost a great deal of blood in the process. The transportation of our own wounded is difficult. It is not possible to dress their wounds properly in the darkness, and they bleed again upon slight motion. As we carry them on the shaky litters in the dark over fallen trees of the park, they suffer unbearable pain as the result of the movement, and lose dangerously large quantities of blood. Our rescuing angel in this difficult situation is a Japanese Protestant pastor. He has brought up a boat and offers to take our wounded up stream to a place where progress is easier. First, we lower the litter containing Father Schiffer into the boat and two of us accompany him. We plan to bring the boat back for the Father Superior. The boat returns about one-half hour later and the pastor requests that several of us help in the rescue of two children whom he had seen in the river. We rescue them. They have severe burns. Soon they suffer chills and die in the park. The Father Superior is conveyed in the boat in the same manner as Father Schiffer. The theology student and myself accompany him. Father Cieslik considers himself strong enough to make his way on foot to Nagatsuke with the rest of us, but Father Kleinsorge cannot walk so far and we leave him behind and promise to come for him and the housekeeper tomorrow. From the other side of the stream comes the whinny of horses who are threatened by the fire. We land on a sand spit which juts out from the shore. It is full of wounded who have taken refuge there. They scream for aid for they are afraid of drowning as the river may rise with the sea, and cover the sand spit. They themselves are too weak to move. However, we must press on and finally we reach the spot where the group containing Father Schiffer is waiting. Father Kleinsorge and Father Cieslik, who were near the center of the explosion, but who did not suffer burns became quite weak some fourteen days after the explosion. Up to this time small incised wounds had healed normally, but thereafter the wounds which were still unhealed became worse and are to date (in September) still incompletely healed. The attending physician diagnosed it as leucopania. There thus seems to be some truth in the statement that the radiation had some effect on the blood. Not the answer you're looking for? Browse other questions tagged world-war-ii nuclear-weapons miracle hiroshima-nagasaki .